Which BPO Company Landed in the Top 5 Most Preferred Employers in the Philippines? Accenture emerged as one of the Top 5 Most Preferred Employers in the Country. 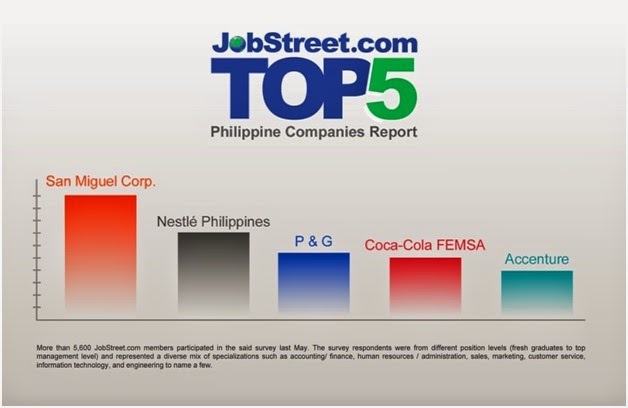 To answer the question “Which companies do most Filipinos dream of working for and why?” Jobstreet conducted an online survey and it shows that San Miguel Corporation (SMC) the only local company in the list emerged as the Most Preferred Employer. Multinational corporations like Nestle Philippines, Procter and Gamble Philippines, Coca-Cola FEMSA Philippines then Accenture, the only company that offers technology services and outsourcing company that's included in the list. Why were these companies picked? It’s about the money… According to the survey, salary is the foremost reason why candidates want to work for these companies. This is across all position levels, from fresh graduates to managers. The more experienced candidates chose benefits as their second preference when selecting an organization to work for. The survey was responded by more than 5600 Jobstreet members from different position levels and specialization. What do you think of the list?